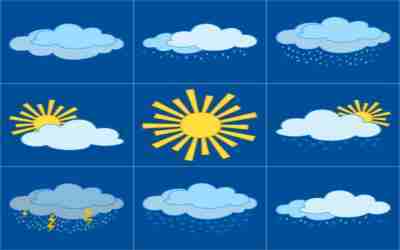 For Northern Ireland weather today just click here and enter your area in the find a forecast box. To say Ireland weather can be summed up as tending towards unpredictable, yes that's a fair starting point . Many would describe it as being mild, moist and changeable with abundant rainfall ! Unpredictable is about right-it could be sunny, rainy, windy, cloudy or all 4 in one day. We lie in the Atlantic Ocean, and as a result are warmed by the North Atlantic Current all year. Met Éireann is the meteorological service of the Republic of Ireland, and the Met Office is that of Northern Ireland. One great thing is the climate does not experience extreme northern irish weather, with tornadoes and similar weather features being rare!!! If you need some northern Ireland Travel Tips here are a few. Pack your clothes, layers are best, bring T-shirts plus a few of sweaters in case it is cooler & jeans/skirts/trousers, whatever you usually wear ? If you are here for a while you might be better to pack very little & see what the weather is like when you arrive! You can then buy clothes quite cheaply at discount stores when you get here. You know how many times you pack that bag going away on holidays and how many times you pack too much and end up walking around in same outfit- ok maybe more relates to men in general? Remember to bring (or buy when you get here) an umbrella, raincoat & waterproof shoes/boots if you anticipate doing much walking outdoors. There is also a huge regional variation at times, with inland areas being cooler in winter and warmer in Summer than their coastal counterparts. During the Spring is mostly pleasant. With flowers in full bloom and the days getting longer, Spring is a good time to visit. Summer is probably the best part of our Northern Irish weather . The days are longer. Daylight begins before 5:00 in the morning and last until after 10:00 at night, which means plenty of time to visit places, walk about, enjoy a pleasant evening. Average day temperature will be 17-18 degrees in July. Good weather is not guaranteed in Summer. Rainy days are not uncommon. Coast lands can be very windy. Autumn can be a glorious time with deciduous trees wrapped in beautiful gold and orange colours. Winter days are very short and this makes touring harder. The weather is colder. Temperatures above 12 C are unusual. Having said that, Northern Ireland has milder winters than many countries on the continent!! In winter, temperatures reach their lowest values in late February or early March. Around the coasts February is normally the coldest month, but inland there is little to choose between January and February. July is normally the warmest month in Northern Irish weather , with mean daily maximum temperatures varying from about 17 °C in the upland areas and along the north coast to almost 20 °C in low lying areas south of Lough Neagh and in Fermanagh. Frost occurs frequently in the winter, with most areas seeing frost every year. In northern areas, air frost occurs most every January, the month in which frost occurs most frequently. Ah yes we like some of this. Mean monthly sunshine figures reach a maximum in May and are at their lowest in December. The key factor is, of course, the variation in the length of the day through the year, but cloud cover plays a part as well. Rainfall in Northern Ireland varies widely, with the wettest places being in the Sperrin, Antrim and Mourne Mountains.Greater exposure to rain-bearing winds off the Atlantic results in higher averages in the more western counties of Fermanagh, Derry-Londonderry and Tyrone. The average annual number of days with snow lying in Northern Ireland varies from less than 5 around the coasts to over 30 in the mountains and this year 2013 is proving to be well over 5! Northern Ireland is one of the windier parts of the UK, with the windiest areas being over the highest ground and along the coasts of Counties Antrim and Down. So in summary we have a mix of everything don't we ! It's a great part of our conversation here the weather-what would we talk about without it!